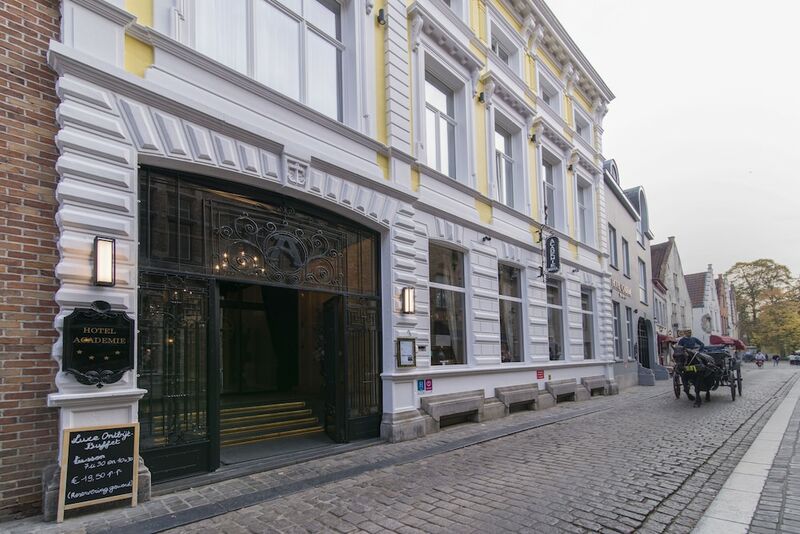 A stay at Academie Hotel places you in the heart of Bruges, steps from Diamond Museum and De Halve Maan Brewery. This 4-star hotel is 12.5 mi (20.1 km) from Zeebrugge Harbour and 0.1 mi (0.2 km) from St. Jans Hospitaal - Hans Memling Museum. Make yourself at home in one of the 90 air-conditioned rooms featuring refrigerators and flat-screen televisions. Complimentary wireless Internet access keeps you connected, and satellite programming is available for your entertainment. Conveniences include phones, as well as safes and complimentary newspapers. Pamper yourself with onsite massages or enjoy recreation amenities such as a fitness center. Additional amenities at this hotel include complimentary wireless Internet access and a television in a common area. Take advantage of the hotel's room service (during limited hours). Wrap up your day with a drink at the bar/lounge. Buffet breakfasts are served on weekdays from 7:30 AM to 10 AM and on weekends from 7:30 AM to 10:30 AM for a fee.